In this paper, we attempt to reconcile the seemingly-conflicting concepts of the CAPM and active investment management. We start by showing how the CAPM leads to passive investing – simply holding the market portfolio. It puts the active manager on the defensive. However, the CAPM provides the foundation which the active manager can build upon, in this somewhat-efficient market. We then recap the basic framework of active investment management, explaining important quantities such as the information ratio (IR), which defines the active manager’s opportunity set. By differing from the consensus view, an active manager invests in a portfolio that is different from benchmark – active management means forecasting. Forecasting returns and risks explicitly allows for a systematic process, and enables measurement of skill. Research has shown that about 90% of risk-return for a balanced portfolio comes from policy asset allocation. Naturally, it is worth exploring tactical asset allocation models as a means to deliver alpha. Tactical asset allocation (TAA) is an investment technique of allocating to asset classes with the best near-term return on risk. It has long been overlooked, but is becoming increasingly popular among asset managers. We provide best-practice experience of what it takes to implement a successful tactical management program by an institutional investment manager. We provide a range of alpha that a manager can expect from TAA, and its main drivers – skill and volatility. Good forecasting skill can be achieved by utilizing a statistical tactical asset allocation model, which should be tested for accuracy and robustness. Finally, we provide an example of results achieved by using a forecasting model that is being utilized in investment practice. Every asset’s expected return is proportional to its beta, with zero expected alpha. Only market risk is rewarded. Holding a portfolio that’s different from the market portfolio takes on additional risk, but no additional expected return. The CAPM leads to passive investing – buy and hold the market portfolio. An active manager’s goal is to beat the market, by holding a portfolio that’s different from the market. Most managers (other than index funds and ETFs) consider themselves to be active managers. A CAPM follower should not be an active manager. Even though the CAPM is a theory based on assumptions, the burden of proof is now on the active manager. The message that active management is difficult is consistent with empirical evidence. The active manager has to work hard in developing his/her investment strategies. The CAPM is an important one-factor framework based on consensus expectations (everyone agrees about the risk and expected return on all assets). It is to be built upon rather than argued against. Most EMH research shows that markets are somewhat efficient; the fact that multiple factors systematically influence returns lead to multi-factor models. Players in this somewhat-efficient market have different information. Better information leads to better opportunity. Thus, market timing and stock selection are the two components of expected active return. 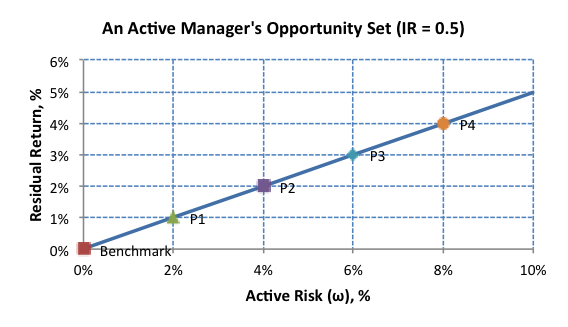 A manager with an IR of 0.5 can achieve 2% active return with 4% active risk, or 3% active return with 6% active risk. IR is independent of aggressiveness. A manager’s IR is the maximum that he/she can attain. Constraints (on short-selling, leverage, etc.) reduce IR. = 2.5% in our example. In practice, active risk is subject to investment policy constraints. We can get the maximum active risk from the range around the investor’s target (policy) asset allocation. A pension sponsor may have a target of 60% stocks, 40% bonds, with +/-10% range. 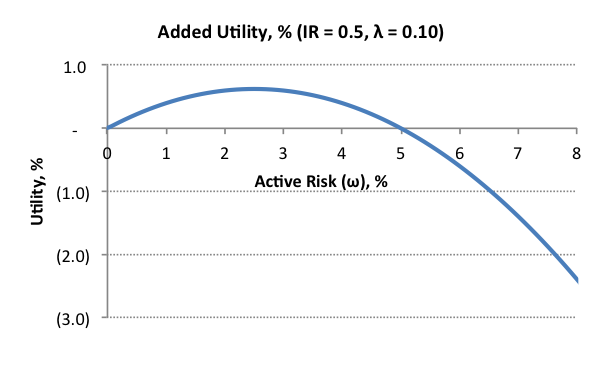 Using typical volatilities of 18% and 6%, respectively, we get maximum active risk of 1.0%. Investment policy constraints limit active risk; an active manager must consider them in determining his/her strategy. Consensus forecast of expected returns lead to the market, or benchmark portfolio. Active managers invest in portfolios that are different from their benchmark – they are, at least implicitly, forecasting expected returns. Explicit forecasting lends itself to systematic management process. Investment decisions must maximize expected risk-return opportunities, rather than be based on opinion. A set of historical forecasts (real-time or back-testing) enables measurement of skill. The correlation between forecasts and actual returns is a measure of skill (termed “Information Coefficient” by Grinold and Kahn). So, IC is critical. Cross-sectional forecasting leads to security selection; time series forecasting – to market timing, or tactical asset allocation (TAA). Once again, there are two ways to add alpha in public markets: security selection and TAA. Research has shown that about 90% of risk-return for a balanced portfolio (stocks and bonds) comes from policy asset allocation (Brinson et. al. (1986, 1991), Ibbotson and Kaplan (2001)). Thus, it makes sense to focus one’s active management efforts on the 90%, asset allocation, rather than on the remaining 10%. TAA means adjusting portfolio asset mix toward asset classes that are expected to deliver the best near-term return on risk. timely feedback through accurate performance attribution. What range of alpha can we expect to achieve from a tactical strategy in U.S. market (stocks vs. bonds)? S&P 500 historical Vol = 18%, and assume the strategy is fully applied to the total portfolio (Score = 1). 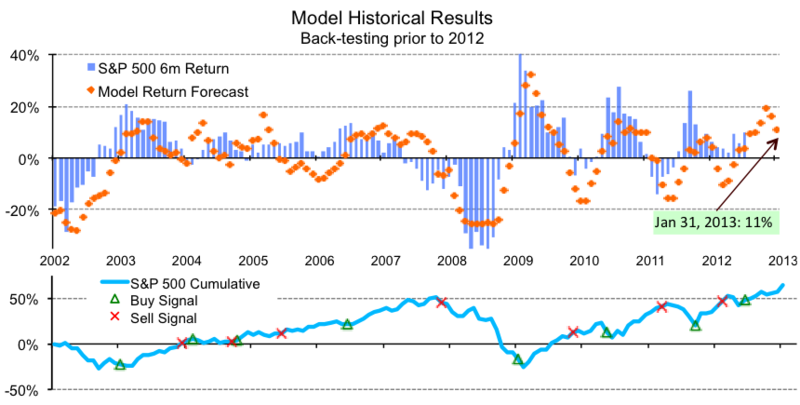 Alpha depends on forecasting skill (IC) of the model. A skill traditionally considered good (IC=0.1) gives alpha = 1.8%. Advanced models with IC > 0.5 can achieve alpha > 9%. About Model Capital Management LLC: we are a tactical investment manager in Boston, focusing exclusively on tactical management. Please review the following pages for more information on Model Capital’s tactical asset allocation research and tactical asset allocation models/strategies. de Bever, Leo, Jagdeep Singh Bachher, Roman Chuyan and Ashby Monk (2013) “Case Study: Global Tactical Asset Allocation for Institutional Investment Management” Investments & Wealth Monitor, March/April 2013. Brinson, Gary P., Randolph Hood and Gilbert L. Beebower (1986) “Determinants of Portfolio Performance.” Financial Analyst Journal, Vol. 42, No. 4 (July/August):39-48. Brinson, Gary P., Brian D. Singer and Gilbert L. Beebower (1991) “Determinants of Portfolio Performance II: An Update.” Financial Analyst Journal, Vol. 47, No. 3 (May/June):40-48. Grinold, Richard C. and Ronald N. Kahn (1999) Active Portfolio Management: A Quantitative Approach for Producing Superior Returns and Controlling Risk. 2nd ed. McGraw Hill. Ibbotson, Roger G. and Paul D. Kaplan (2000) “Does Asset Allocation Policy Explain 40, 90, or 100 Percent of Performance?” Financial Analyst Journal, May/June 2000, Vol. 56, No. 3:16-19. ¹ Total returns rather than excess returns are used here, and throughout this paper, which eliminates the need for a risk-free component.